Living walls are all the rage and one way to cash in on the awesome trend is with interior MOSStiles by Benetti Stone Philosophy. 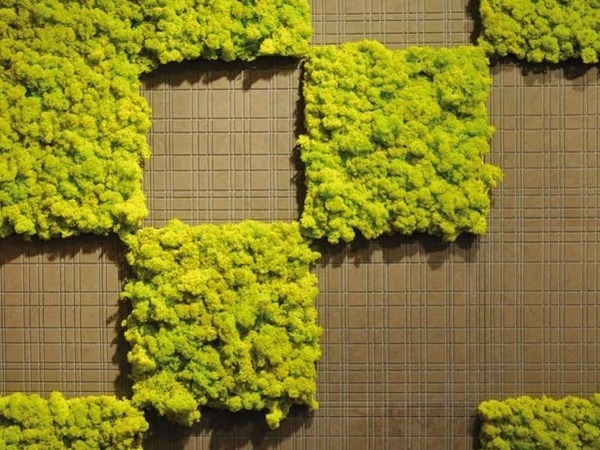 These modular living tiles come in 12 different shades and are virtually maintenance free needing no watering, fertilizer or even direct sunlight, maintaining their lush appearance relying only ambient humidity alone. Like a living wallpaper or even art, MOSStiles will brighten up your space with living plants. The MOSStile is made of an ecologic resin base imbedded with natural moss for use indoors. No toxic substances are used in the making of the tile and no chemicals or fertilizers are needed to maintain them once they are installed. Maintenance is practically non-existent and no watering (except for an occasional misting) is necessary. The moss pulls all the nourishment it needs from an environment of at least 50% humidity. MOSStiles should not be placed in direct sunlight as diffuse light or even no light is best for them (great news for those of us who inhabit cave-like city apartments). Measuring 29.8 x 29.8 cm in size, the modular tiles can be placed in any configuration, as a pattern, as a whole wall or as a single square, circle, rectangles or even the inverse of one of these shapes. Thousands of possibilities exist to create any sort of patterns out of the 12 beautiful colors. Hey, just because you want to be green, doesn’t mean your living wall has to be. so how do the tiles themselves attach to your wall? Plenty of misinformation in this comment thread lead me to sign up for an account just to let you guys know the real deal... I am using this product on a project and am currently in possession of a sq. ft. tile. This stuff is awesome! And expensive! It is definitely, definitely alive. Reindeer moss is what it's called, which is a type of lichen. At the time of harvest, it goes through a salting process that retards its growth, so it will never shrink or grow again, but will stay alive. It is grown in Scandinavia on a sustainable farm where the product is trimmed off the top and then placed onto a plaster tile. It sets into the plaster and as long as it is not pulled out, it remains there, alive. It is dyed with various natural products, like beet juice, to get the vibrant colors, after harvesting. It requires virtually no maintenance in at least 50% humidity, but I have been spritzing it to keep it soft and moist and bright. There is one supplier in the US, which is Green Up LLC is Stamford CT. I should get paid for this kind of marketing, shouldn't I? i want to use these tiles at my interior site. how can i buy it? OK, i just examined some of the other photos ... that does not look like moss. It appears to be a lichen. In the US, it's called "Reindeer Moss" -- called a moss, even tho' it's actually a lichen. And the colors they have indicate that those "mosses" were dyed. So this stuff, as pretty as it looks, is preserved. Not alive. Thanks for the response. I was interested in more details ... it's a resin base. But I am wondering how the moss is attached to that resin base. Do they grow the moss from spores or starter cultures? Or is it transplanted and attached? What kind of moss do they use? The stuff may grow everywhere in nature, but it's not that straight-forward to cultivate it indoors. They just said it. They use a resin. Moss has no roots, it'll practically grow on anything. You see it all the time on rocks, exposed mineral soil, disturbed soils, acid soil, calcareous soil, cliff seeps and waterfall spray areas, streamsides, shaded humusy soil, downed logs, burnt stumps, tree trunk bases, upper tree trunks, and tree branches, cracks between paving stones in damp city streets, and on roofs and concrete walls. It doesn't take much skill to grow this stuff on purpose. Beautiful! How do they secure the moss to the growing substrate? The MOSStile is a tile of ecologic resin base imbedded with natural moss for use indoors. No toxic substances are used in the making of the tile and no chemicals or fertilizers are need to maintain them once they are installed. Maintenance is practically non-existent and no watering except for an occasional misting is necessary. The moss pulls all the nourishment it needs from an environment of at least 50% humidity. 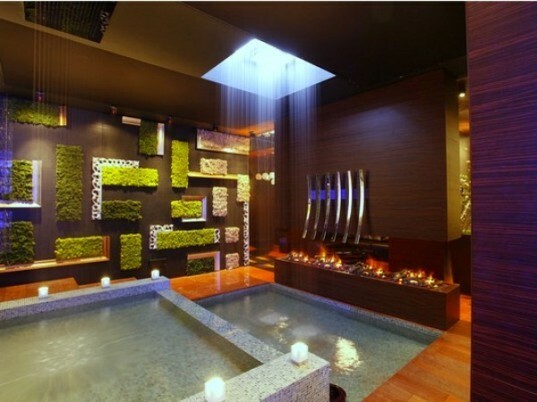 MOSStiles should not be placed in direct sunlight as diffuse light or even no light is best for them. Measuring 29.8 x 29.8 cm in size, the modular tiles can be placed in any configuration. They can be placed in a pattern, as a whole wall or as a single square, circle, rectangles or you can even have the inverse of one of these shapes. They can even cover objects. Thousands of possibilities exist to create any sort of patterns out of the 12 beautiful colors. Just because you want to be green, doesn't mean the living wall has to be green. Here is a whole wall of MOSStiles. The 12 shades of MOSStile.